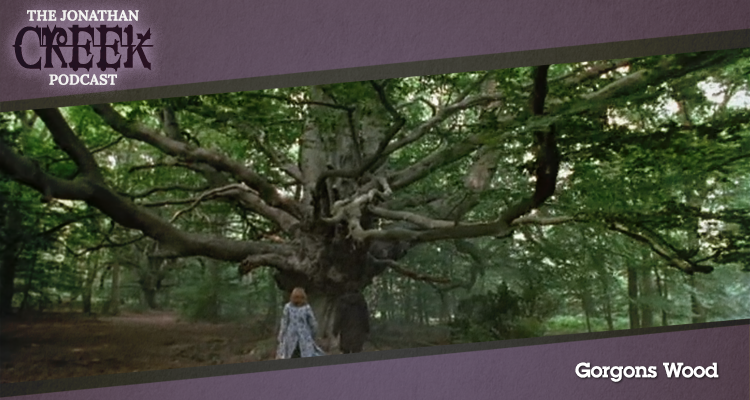 Gorgons Wood was the final episode of Jonathan Creek‘s fourth season. After a mystical ancient statuette goes missing Jonathan and Carla must navigate a toxic case of sibling rivalry. In this podcast Gerry and Iain consider the naming conventions for wooded areas in the United Kingdom. Brother and sister Owen Glendower (Michael Cochrane) and Thelma Bailer (Celia Imrie) feud over a missing piece of porcelain which leads Thelma’s daughter Gillian (Alice Patten) down a dark, ultimately fatal, path. There were cameos for Brenda Cowling as a litigant claiming Adam Klaus hypnotised her through the television and for Bamber Gascoigne, ostensibly as himself. This was the final appearance of Julia Sawalha in the role of Carla Borrego. Gorgons Wood was written by David Renwick and Sandy Johnson returned as director. Verity Lambert produced her final episode of the show, sadly passing away at the age of 71 before Creek returned from its hiatus. Gorgons Wood was released in 2004. It is 60 minutes long and originally aired on the BBC. The episode is available in an edited format on Netflix in the UK and Ireland, and the entire series is available on DVD in the UK and other countries, including a comprehensive box set of all the episodes up until Christmas 2016, released by the BBC.